Bay Area heavy-Krautrock-psych band Mondo Drag premiere the first song from their forthcoming self-titled album today. Mondo Drag recently signed to L.A. label RidingEasy Records to release the band's sophomore album, a culmination of many journeys: sonic, physical and temporal. 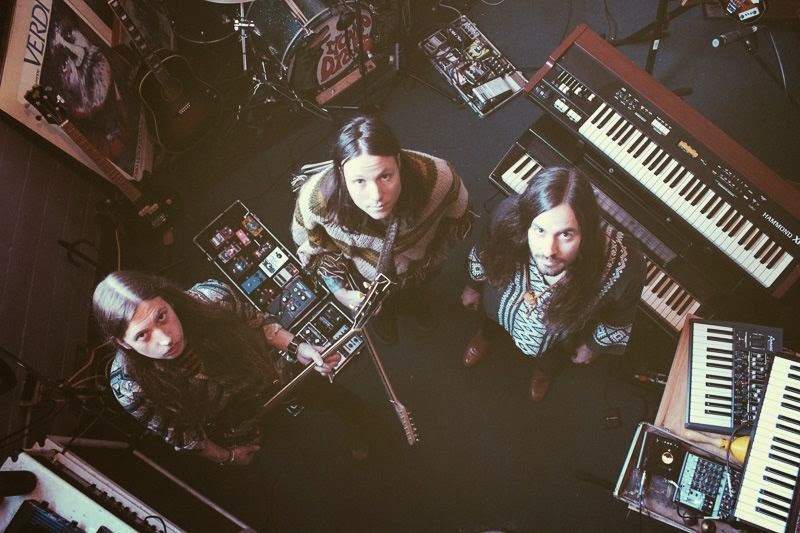 The creatures known as Mondo Drag originally hailed from deep along the banks of the wild Mississippi River where they created ominous, spiritual, savage psychedelic revival sounds. Under the spiritual guidance of the forefathers of heavy psych, prog, and proto-metal, Mondo Drag has created an amalgamation of sounds the likes of which have not been heard for decades. The band's unique sound, and rare cohesion probably stems from the fact that core members John Gamino (keyboards, vocals), Nolan Girard, (guitar, synth) and Jake Sheley (guitar) grew up together and have been playing music with each other for 15 years.